These customized 2 x3.5 garden nursery business card magnets round corners – 25 MIL work great for gardening services, plant nurseries, botanical gardens and many other green friendly marketers trying to build their business. This business card magnet offers them enough space for imprinting their brand, contact and business information. It is being offered in an affordable price range and marketers can make price savings by bulk ordering these magnets from us. 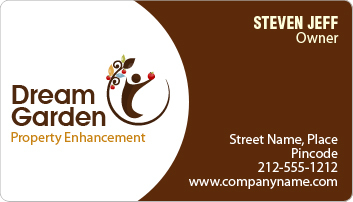 These garden nursery business card magnets are crafted to perform for long time and they offer real value for investment! Request a quote to know wholesale price benefits for these promotional 2x3.5 garden nursery business card magnets round corner – 25 MIL. Product Size: 2 in. x 3.5 in.